It also has not been the worst of summers. It has also not been the best of summers. Compared to problems many other people are experiencing, our lives are greatly blessed and our problems are small. I have a loving husband. My son is doing well at work and college. We are not homeless or hungry or sick with a scary disease. Our car survived JJ putting diesel in the gas tank instead of unleaded gas. Still this summer has been wearying, and this last week was not fun either. EJ didn’t feel well and ended up staying home from work from Monday through Thursday. On Wednesday we took him to the doctor. She sent him for a blood test and x-ray to check for appendicitis or some sort of blockage. The tests came back negative, which is good, but we still didn’t know what was wrong. EJ returned to work on Friday. Several co-workers said they also have been sick, and they described his exact symptoms, so maybe it’s just a bug going around. I sure hope so. It’s been two weeks since I have mowed the lawn. I tried again to mow the lawn on Thursday, but again couldn’t get the stupid mower to work. EJ said a wire is probably shorting out (or something) and he could fix it, but he’s been sick so he hasn’t been able to fix it yet. The mower is a small problem, but it’s another problem in a frustrating summer and I really felt like taking a sledge hammer to it. I really wish it could have lasted another month so that we wouldn’t have had to worry about it until spring. If the grass gets more then about six inches long, the Village will fine us $50. I have spent most of the summer cleaning up diarrhea from the cats, washing and disinfecting litter boxes and the back porch where we had the sickest cats in isolation, I’ve also scooped up worms and poop and urine to be analyzed by the vet. EJ and I have given a variety of meds to struggling unhappy cats. We have bought more expensive, better quality foods for the cats. Most of the cats got better, but some cats continued to have problems. I was getting exhausted and the situation was becoming intolerable. We had to make some difficult choices. Earlier this week, Annie was sitting next to me on the couch and she peed all over me and the couch. We moved the cushions and discovered that she had been peeing on the couch for probably about a week. We hauled the couch to the truck and took it to the landfill the next day. Fortunately, the secondhand couch had only cost us $10, but it was a very nice well-made couch and could have lasted years more. We can’t have any more furniture peed on, so Annie has become an outside cat. We considered finding her another home, but in these tough economic times no one wants an adult cat who pees on couches. Fortunately Annie is adjusting well outside. I spend time with her when I am outside. Luke had been peeing on the floor, so he was in isolation on the back porch with Yafah. He is JJ’s special cat whom we raised from a tiny kitten, so we decided to take him to the vet to see if he had a urinary infection. If he did, we would do our best to treat him. If his problem was behavioral, he’d have to join Annie outside. We took him to the vet yesterday morning and learned that he has crystals in his urine–so his problem is medical not behavioral, which is good. We have to give him antibiotics and a very special food. He is still in isolation, but when he improves he can join the other cats in the house. That left Yafah. Yafah seemed to improve a little bit, but then her diarrhea returned. We believe Yafah is the source of the health problems and we couldn’t risk her re-infecting the other cats. Neither could we continue exhausting ourselves and our finances. So yesterday EJ took her to the vet on his way to work and had her put to sleep. He asked the receptionist if she knew of ANYONE who would take her, but she said that they have a long waiting list for healthy cute little kittens needing homes. There was no hope for Yafah. EJ cried as he left her. It was very sad. 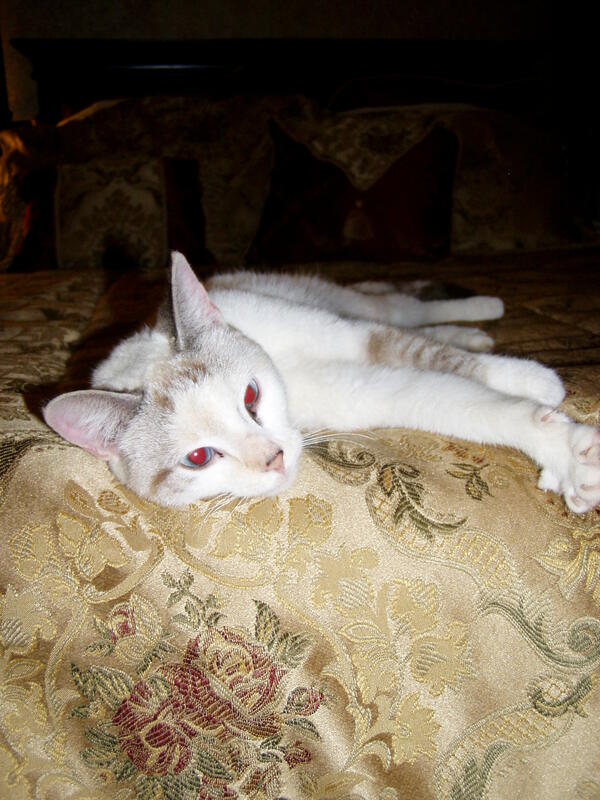 Yafah was a beautiful, sweet, and interesting cat, but the situation had become intolerable. When we took her into our home, she was a starving, wounded, and homeless stray. At least she had a loving home for the last year of her life. I will be very, very glad to see this summer go. Hopefully the autumn will be more calm and peaceful. On a good note, I got the garden path finished. A small section of bricks near the bees is not as level as the rest, but overall it looks pretty good. The path is now wide enough for me to get the mower through. When the mower gets fixed, that is. Such hard decisions to make when it comes to our four-legged friends. It is difficult, Cris. We really love our pets. JJ was very upset that we would even CONSIDER putting a pet to sleep, but sometimes we have to make difficult decisions. We did our best, but could do no more.